Mutual Fund Riskometer – How to measure risks? Investment decisions are usually based on an investor’s risk appetite. Someone in their early or mid-twenties might have an aggressive approach towards investing in equities whereas a retired person is likely to prefer risk-averse fixed-income investments. To help investors be aware of the risks associated with Mutual fund investments, SEBI has made it mandatory for all fund houses to display a riskometer depicting the five levels of risk effective July 1, 2015. According to the norms, ‘the color codes will have to be displayed on the front page of the application forms next to the name of the scheme.’ These Color codes will be representative of the financial risk associated with the scheme. As per the SEBI circular, ‘The depiction of risk using color codes would be replaced by pictorial meter named riskometer and this meter would appropriately depict the level of risk in any specific scheme. As shown in the figure, the riskometer has five levels of risks. It is made to look similar to a car’s speedometer and indicates the scheme’s risk level. 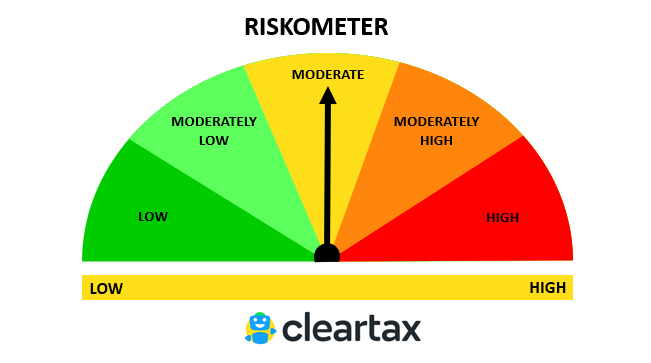 The five risk levels are ‘low’, ‘moderately low’, ‘moderate’, ‘moderately high’ and ‘high’. Let’ see each of them one by one. The earlier version of the riskometer had three colors blue, yellow and brown representing low, medium and high levels of risks respectively. However, AMFI felt the representation was inadequate and decided to revamp the riskometer by categorizing risk into 5 levels. This helped investors get a clearer picture regarding the right fund to invest in. Note: The colors shown in this diagram do not depict the actual colors of the riskometer. The picture is for representation purpose only. Securities and instruments such as fixed maturity plans, gilt funds and income funds usually come under this classification. These are considered to be the safest mutual funds and are suited for an investor looking for a safe income source. Short to medium term bonds usually come under this category. They are considered safe investments and are suited for investors who can stay invested for a period of 1-3 years. It signifies that the funds in this category have their principal at a moderate risk. Instruments such as Arbitrage funds, MIP funds, Hybrid debt-oriented funds. This category of funds are suited for a semi-conservative investor who intends to book decent profits at the same time wants to keep his risk limited. Funds under this label are suited medium to long-term investment horizon. It signifies that the funds in this category have their principal at a moderately high risk. Usually, balanced equity-oriented funds, Diversified Equity funds, Index Funds and Gold ETFs are classified under this label. Products under this label are suited for investors seeking to create wealth over a long period of time. Investment in equity under such funds is related to the large-cap segment. This label means that the funds in this category have their principal at a high risk. Sectoral funds, thematic funds, International funds and micro-cap funds are a few examples of funds under this label. Products under this label are suited for investors seeking to create wealth over a long period of time and are fine with the high risk associated with their bet. Similar to the risk labels on the riskometer, investors can also be classified based on their ability to take risks in investments. See which band you fall into. Low Conservative Investor’s top priority is the safety of capital. She/he is willing to accept relatively low returns against a low risk of principal. Moderately Low Moderately Conservative Investor is willing to accept a small level of risk in exchange for some potential returns over a medium to long-term. Moderate Moderate Investor can tolerate a moderate level of risk in exchange for relatively higher potential returns over a medium to long-term. Moderately High Moderately Aggressive Investor is keen to accept a relatively higher risk to maximize potential returns over the medium to long-term. High Aggressive Investor is willing to accept a significant risk to maximize potential returns over the long terms and is aware that she/he may lose a significant part of the capital. Since the universe of mutual funds is vast with hundreds of funds out there, investors can use the new riskometer to choose schemes which are in sync with their risk appetite. This meter is especially useful to investors who are new to the world of mutual funds and usually depend on the advice of their financial advisors. However, it is important to note that although the riskometer can give an overall idea of the risk level there are many factors involved that should be considered while selecting a fund and a riskometer should not be the sole indicator. Hence it is important to do your homework and judiciously make the decision regarding your investments. Confused? Don’t worry, we have already done this research for you. With Cleartax you can invest in the best performing mutual funds handpicked by experts.